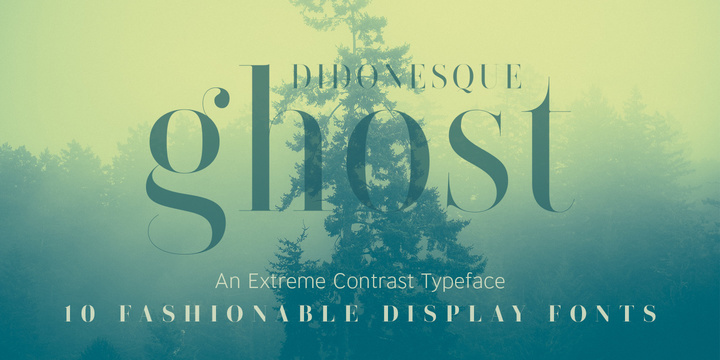 Didonesque Ghost is a contemporary typeface created and published by Paulo Goode which is available in 10 styles, 5 weights (from Light to Ultra) with accompanying italics, over 700 glyphs per font, useful OpenType features and multilingual support. It was designed to be suitable in very large diplay purpose, signage, poster, headline, branding & advertising, wedding and so on. This fashionable font is characterized by high contrast and it merge well with Didonesque font. Enjoy! A font description published on Friday, November 10th, 2017 in Fonts, Paulo Goode, Paulo Goode by Alexandra that has 2,260 views.